As men age, they often develop an enlarged prostate. When the prostate becomes enlarged, it is known as a condition called benign prostatic hyperplasia, or BPH. The prostate is a walnut-sized gland that surrounds the urethra, which is responsible for carrying urine from the bladder out of the body. As the prostate gets bigger, or enlarges, it can block the urethra which often leads to problems with urination. The added pressure on the urethra as a result of an enlarged prostate can make it more difficult to urinate. 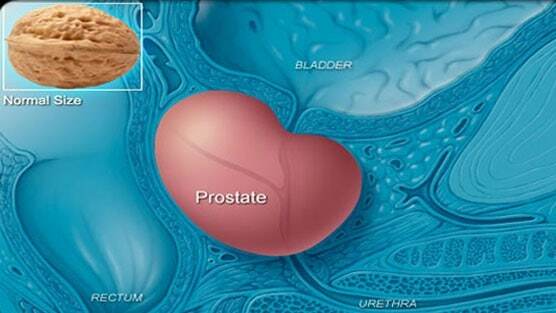 BPH is a growth of the cells within the prostate gland – but it is not cancer. It is also not a sign of cancer and does not lead to cancer. However, it is possible to have BPH and prostate cancer at the same time. By age 60, more than half of men have BPH. By age 85, about 90 percent of men have BPH, but only about 30 percent will have symptoms. It is unclear as to what the cause of BPH is exactly. It is believed that the condition is a normal part of the aging process and is likely caused by changes in hormone balance and in cell growth. Other risk factors that increase a man’s risk for BPH include a family history of the condition, having diabetes and heart disease, obesity, physical inactivity, and being Caucasian or African-American. • Feeling that you have not completely emptied your bladder after you urinate. How is BPH diagnosed? BPH is diagnosed by a urologist who will evaluate your symptoms and do a series of tests including a digital rectal exam, a prostate-specific antigen blood test, and a urine test. Once the diagnosis is confirmed, the type of treatment you receive depends on the severity of the condition. The most optimal treatment option depends on the size of the prostate, age, overall health, and the severity of the symptoms. Two of the most common and effective treatment options available for BPH include a Transurethral Resection of the Prostate (TURP) and Greenlight Laser PVP. A TURP is an invasive surgical procedure that removes excess growth around the prostate gland. It is performed by a urologist in a hospital under general anesthesia or spinal anesthesia coupled with a sedative. A resectoscope (an instrument much like a cystoscope with the advantages of a microscope, light, irrigation capability, and a wire loop) or a spring-action cutting tool, is inserted into the urethra to access the enlarged prostate gland. The electricity generated through the cutting tool removes small pieces of tissue until the urethra is no longer restricted. To control bleeding, the vessels are cauterized by the wire loop and the bladder and urethra are irrigated with a saline solution. A urinary catheter is put in for the purpose of resting the bladder and prostate, keeping the urethra open if swelling develops, and to empty the bladder of blood to avoid clotting. The procedure takes about 90 minutes to two hours. TURP has several advantages over the newer technologies. For men with other health problems that make the newer procedures inadvisable, TURP is the best option for treatment of BPH. If the prostate has grown too large, newer procedures they may not be effective, and some may feel more comfortable with surgery than an unfamiliar technology. • Traditionally taught in medical schools so doctors have extensive experience. A new and promising laser procedure, GreenLight Laser PVP (photoselective vaporization of the prostates) has been demonstrated to remove prostate gland overgrowths using pulses of light with nearly no bleeding, less catheterization, and a greatly reduced recovery time. The procedure uses the technology of high-powered laser light combined with fiber optics to vaporize the overgrowth of prostate cells quickly and accurately. As the surgeon directs the laser at the prostate, the intense pulses of light emitted from the fiber are absorbed by the blood. Within moments, the temperature of the blood becomes so great it causes the nearby cells to vaporize. GreenLight is being used as an alternative to a TURP and has been shown to be its equal in terms of effectiveness in improvement of symptoms. There is growing interest in this technique by patients and practitioners because of its simplicity and efficiency. GreenLight stands alone in its ability to give patients quick symptom relief, ease and comfort of urinary flow, and minimal short-term side effects. This technique is too new for long-term studies to have been completed, but after five years it has been shown to maintain its level of improvement in urinary flow and comfort, and for giving men the quality of life they deserve.